Pakistan Telecommunication Company Limited (PTCL), the country’s leading telecom and ICT services provider, has announced its financial results for the quarter ended March 31, 2019, at its Board of Directors’ meeting held in Islamabad on April 17, 2019. 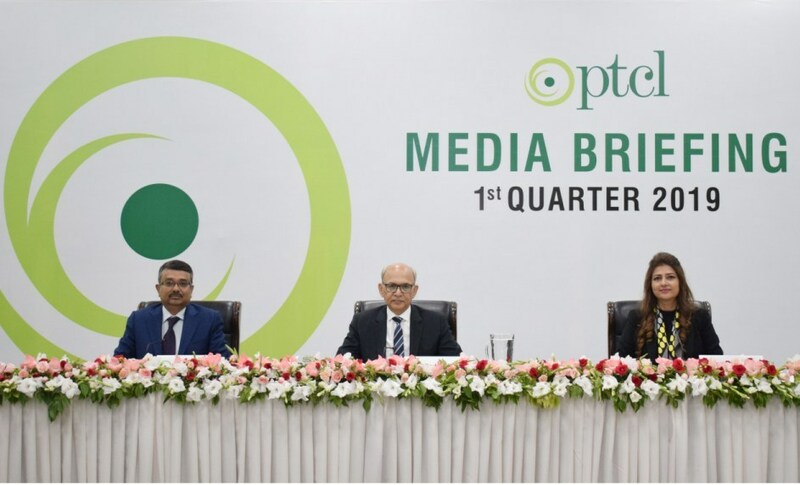 PTCL Group’s revenue for the quarter has grown YoY by 11% to Rs.33.5 billion as a result of accelerated growth in the Ufone and Ubank revenues. Ufone revenue has increased double digits YoY, UBank, a microfinance banking subsidiary of PTCL, has shown significant growth of 53% in its quarterly revenue over last year. PTCL Group’s operating profit and net profit for the quarter have improved by 34% and 95% respectively as a result of the revenue growth. PTCL revenue of Rs.17.9 billion for the quarter is slightly lower than last year. PTCL’s flagship Fixed Broadband services posted revenue growth of 5.8% over last year. PTCL continues its journey to upgrade top 100 exchanges under the Network Transformation Project (NTP) in different parts of Pakistan. For the 76 exchanges fully transformed to date in 12 cities, YoY revenue growth is even higher at 12% and there is a 40% reduction in customer complaints. Corporate business continued its growth momentum from a strong 2018 and has achieved a double-digit growth YoY. Growth drivers for corporate business are Cloud Infrastructure, IT, Security and Managed Services projects. Wireless revenue for the quarter has declined on a year-on-year basis due to strong competition by the cellular companies providing wireless data services. There is a continued decline in domestic and international voice revenues due to illegal/grey traffic termination, continued conversion of subscribers to OTT and cellular services resulting in declining voice traffic volumes. PTCL posted a Net Profit After Tax which is 10% higher than last year. Operating profit for the quarter remained under pressure compared to last year mainly due to increase in operating cost on account of a significant hike in power tariffs. However, non-operating income has increased due to higher income on investments as a result of a significant increase in benchmark interest rates by the State Bank of Pakistan. As a national company, PTCL has undertaken various initiatives for climate change and environmental preservation such as collaborating with the Ministry of Climate Change to support the Clean Green Pakistan Movement by planting 200,000 trees on company sites. Further, PTCL being an environment-friendly company has also launched a campaign for its customers to opt for eBilling, instead of receiving monthly paper bills. PTCL headquarters, a green office certified by WWF, observed Earth Hour to show its support towards the global cause. Being a national company, PTCL shared patriotism of every Pakistani in their love of motherland by supporting ’Sherdil’, a Pakistani movie that highlights the sacrifices, courage, and spirit of our PAF pilots, which brought the entire nation together in solidarity and love for Pakistan.